Like the incredible shrinking chocolates that cost the same but come in smaller packages, winter isn't exactly filling its three month package like it used to. This Snow Wall-E was looking pretty lonely on Hawthorn, before it too succumbed to the browns and grays of mild weather. At some point, during a family birthday dinner at Eno Terra, I looked up at the cloudlike lights drifting over the room and asked myself, "When did vegetables become more fascinating and profound than meat?" Everything was delicious, but the vegetables in particular were prepared in such a way that one could take a long pause to savor after each bite. The experience itself, like the flavors, seemed to resonate far beyond one evening and one meal. Might vegetables--so much easier on the planet to grow--start to take starring roles in our diets, less from necessity or the calls of conscience than from all they have to offer? That possibility has been out there for a long time, but my love of meat has long competed with any ambitions I might have as a plant lover to see plants outshine animals at dinner time. One of the star vegetables that evening was Romanesco--yet another manifestation of that amazing species, Brassica oleracea, from which originated cabbage, broccoli, brussel sprouts, kohlrabi, kale, cauliflower, and others, in much the same manner as all dogs were bred from a single species, Canis lupus. It's fun to think of each of these vegetables as representing an expansion of one particular part of the original plant. Brussel sprouts are lateral buds, kohlrabi is an expanded stem, and broccoli emphasizes the flowers. Interesting to find out that the original plant in the wild was intolerant of competition, surviving on the cliffs of Dover and other poor soils that discouraged the more rank species that would otherwise shade it out. It was, in effect, one of those rare, seemingly weak, marginal, uncompetitive plants that only a botanist could love, and that much of humanity would dismiss as unworthy of our concern. Now it feeds most of humanity. Romanesco has a wonderful taste, and can be easily cooked. We've tried it various ways, and actually prefer the simplest means of cooking, in the microwave, in a covered bowl, cut into four pieces with some olive oil and salt. A visit to the Whole Earth Center's produce department got me into a conversation with staff about the mathematical formula that describes Romanesco's spiraled shape. Words like fractal, Fibonacci number, and Mandelbrot set filled the air, making it clear I wasn't in ShopRite anymore. The take-home lesson, along with the Romanesco itself, was that vegetables can dazzle in flavor and mathematically profound shapes. There's an endearing story, a mathematical romance called The Dot and the Line, by the author of Phantom Tollbooth, about a boring line that learns to take on all manner of shapes to wow the dot he loves. She quickly loses interest in the shapeless squiggle she had been hanging out with. If humanity ever got serious about slowing climate change, and a radical shift away from meat spread across the populace, it's good to know we wouldn't need to suffer, and might even come to like it. Update: Another manifestation of that renaissance vegetable, Brassica oleracea, on Columbus Circle in NY. Soon, we'll have "cabbage shows" to rival dog shows, as buff cabbages are paraded in front of scrutinizing judges. You could say this is just a photo of a local park with a lawn and a couple trees, but that would be missing the big picture. What we have here is a win-win-win-win. Now, I've always wondered why win-wins, not to mention win-win-win-wins, don't get people more excited. Anyone interested in making the world a better place knows that, given what a fix the world is in, and how busy people tend to be, if we just get one win at a time there's no way we'll ever reach our goal in time to kick back and enjoy a nice cool drink on the veranda. With all the forces conspiring to make the world a worse place, we need wins in big batches--twos, threes, as many as we can get. So, please, show a little excitement when I point out all the wins in this photo. They all have to do with those magical things called leaves. For twelve years, I've watched those white oaks grow, each year extending their branches to offer more shade for the picnic tables beneath them. As if calibrated to the shade, birthday parties seem to grow in size and frequency each year, centered under the trees and radiating out across the park. Clustered there next to the sandbox, they are the right trees in the right place, and whoever planted them should be given an award for creating an oasis of beauty and comfort where people can come together. But what to do with those leaves when they fall, albeit very slowly through the winter, being oaks. That's where the other wins reside, for there was a time when the town would swoop in with a big crew and a big truck, then spend most of the day blowing the leaves into a pile, muscling them into the truck, and hauling them out of town to the compost center. Nice compost, you might think, but at what expense? There's the man-hours spent, the truck to buy and maintain, the extra time to drive out of town, the export of nutrients from the park, and all the while, greenhouse gases being scattered to the winds to further trouble the earth. A few years ago, seeing all these negative impacts on budget, park and planet, I asked the parks director if the town (okay, "municipality") could return to the old borough approach of simply mowing the leaves back into the lawn. That way, the parks department would be modeling what its environmental commission has been recommending all along, that people utilize their leaves rather than blow them to the curb. What a joy, then, to see that this year the parks department has adopted this approach in Potts Park and elsewhere. In this photo, you can see the mulch-mowed leaves nestled between the grass blades, where they will decompose, feed the lawn, reduce runoff, and maybe even make the ground a little softer when kids fall. There's a brown tint to the lawn, but that will quickly transition back to green. This far into the blogpost, I've lost count on how many wins this simple change in lawncare has achieved, and the tally wouldn't even include all those lower priority tasks the parks crews will now have time to do. So, grab a mower or fashion a leaf corral, and see how many wins you can gather in your own yard, and later, while sitting on the veranda, make a toast to a better world. The leaves of winged burning bush (Euonymus alatus) turn bright red in full sun, or white in full shade. This photo shows the gradation on a single bush. Please, by the way, don't plant this species, and if you have it, consider replacing it with some less invasive colorful shrub. It can be pretty, but winged burning bush has proven highly invasive in local woodlands, outcompeting native shrubs and shading out spring wildflowers. This maple on Aiken may have gotten a farmer's tan on the top because the lower half is shaded by the tree across the street, and thus is slower to change color. The stereotype is that "kids these days" tend to stay indoors, discouraged from outdoor adventure in part by woods that have become impenetrable thickets of thorny invasive shrubs. A striking counter-story to that stereotype played out in Princeton's Gulick Park this past summer. Some of Princeton's open space has very little native plantlife on the forest floor, due to past plowing. In areas where the invasive shrubs haven't filled the void, the combination of trees, sticks and empty ground can make an appealing canvas for the imagination--essentially a natural playground for kids. Some schools, such as the Willow School in Gladstone, NJ, and the Princeton Friends School, incorporate natural playgrounds into their campuses. Attendees of the Princeton Environmental Film Festival will remember a wonderful documentary called School's Out about a completely outdoor kindergarten in Switzerland. Princeton's evergreen forest in Community Park North, planted back in the 1960s, was a natural playground until most of the trees blew down during Hurricane Sandy. My first inkling that not all kids were spending the summer huddled in front of computers and lounging on sofas with cell phones came when biking through Smoyer Park. There, in the open woods near Snowden Lane and Van Dyke was a shelter carefully constructed out of sticks. The workmanship, or workpersonship, was impressive. Here's what I found on a recent visit. There were promising signs of construction along the main drag, a broad trail that extends into the woods from a little deadend fragment of Terhune Rd near Dodds Lane. Those lean-to structures are mere prelude to the village further in. Small abodes fashioned of sticks and yarn--shall we call it Yarnia?--stretch along leafy trails that hint at a matrix of streets. Might the streets have names, and if so, would they be like Princeton's tree streets, except that Sweetgum Lane would actually have sweetgums growing along it? Or would the streets have far more fanciful names from some other world entered only through the imagination? This one reminds me of a shelter that some friends and I made deep in the woods when we were kids. The project ended when my face broke out in a poison ivy rash from digging roots out of the ground to make a nice floor. Poison ivy roots have the same oil as the leaves, apparently. The rash gave me Nixon-like jowls for a week. Still, it's a very positive memory. At times like this, it would have been helpful to have read fantasy fiction, to better understand whether these pebbles are a literary quote or, perhaps, some sort of currency for use in transactions with other forest dwellers, with protective netting to keep the Rock Doves from stealing them. A bit of speculation here, that the village's proximity to Gulick Preserve's pond is not coincidence. Wikipedia tells of the Wood between the Worlds, "a pond-filled forest in The Magician's Nephew (1955), the sixth book in The Chronicles of Narnia by C. S. Lewis. Each pond is a portal that provides instant transportation to a "world" such as ours and Narnia's." The kids must have been surprised, one fateful day in early September, to step into the pond and be instantly transported to school. The narrow little raingarden in front of the Whole Earth Center, along the Nassau Street sidewalk, is a bit of an anomaly. It flourishes beyond all expectation and despite several factors that could easily work against it. Portions of it are covered by a canopy, which means those areas receive no rain. And though I weed it periodically, do some thinning and trimming, and clean up any trash that blows in, there are others who take care of it as well. A professional landscape crew comes in each spring and lays down fresh mulch. I see signs now and then that someone on staff is also paying it some attention. That none of us communicate or coordinate would normally lead to problems, and yet it all works out. There are, too, a few plants in the raingarden that wouldn't normally be considered ornamental. Fringed sedge and deertongue grass are wild natives, and yet provide a look of surprisingly attractive grassy opulence along the sidewalk's edge. And the native coralberry in these photos, taken a few weeks ago, makes a nice mound at the building's corner. Bees, I discovered one day walking by, take an interest in coralberry deep into the fall. A closer look was rewarded by this scene. Turns out the coralberry has its own brand of commerce--a sort of roadside stand set up in front of the Whole Earth Center, serving organic nectar to honeybees. It's not coincidental that this native shrub looks reminiscent of the nonnative and frequently invasive honeysuckle shrubs. Both are in the family Caprifoliaceae. Grab your botanical latin books to find out the meaning buried in the scientific name, Symphoricarpos orbiculatus. At the other end of the raingarden are the more mainstream native shrubs, favored for the showy flowers and bright fall colors that the coralberry doesn't deliver on. Fothergilla (witch alder) turns brilliant orange, contrasting with the purplish oak-leaved hydrangia behind it. One nice trait of the corralberry for us lazy propagators is that it makes new plants when its branches touch the ground. Each can be dug and grown into a fullsize shrub. From old raingardens, new ones can be born. 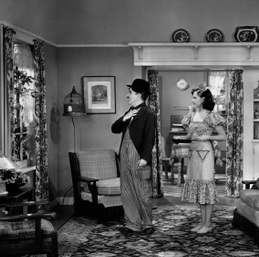 There's a scene in Modern Times where Charlie Chaplin's fantasy of domestic bliss includes reaching out the window to pluck some grapes. A cow comes to the back door to supply milk. Nature is cleverly tended to put its bounty within arm's reach. I think of that scene every time I bicycle over Princeton University's graceful Streicker Bridge above Washington Road, ever since I noticed some native persimmon trees rising up alongside the bridge. They were planted intentionally, like Chaplin's grapes, and each year they've gotten higher, pressing their leaves and fruits closer to the fencing . Posts from 2014 documenting the persimmon trees' rise can be found here and here, and a 2015 post is entitled "Close but no persimmon". There's a catalpa growing within reach as well, but that's not as appetizing, somehow. This year, the long awaited casual Chaplinesque reach was finally possible. Heading to a university soccer game, I'd check their progress. The fencing is a real deterrent, though, as if Chaplin's dream of domestic bliss were set in a high-crime neighborhood where all the windows were barred. At last, time and fruit seemed ripe. But wait, one problem. It's a persimmon. Can't they be astringent in the extreme? So much expectation, only to have a very pucker-mouthed ride home. The soccer season passed less than gloriously into history, the leaves fell. A few persimmons remained on the tree, but out of reach. Giving it one last try, I gave up on the fruits coming to me and went down below the bridge to see what lay on the ground. There, preserved on top of a leaf, was one ready to taste. It was sweet, without a hint of astringency, delicious beyond all expectation. Sometimes dreams don't play out the way you imagined, but they can still come true. stick them in a pot and make a new plant." Ours is a secular christmas cactus, blooming as it does during Thanksgiving. Like a volunteer hardwired to serve the community, it needs no coaxing or pampering, but seems intent on making the world a better place, thriving on little more than inner drive and our gratitude.